• on lice in eyebrows or eyelashes. See a doctor if lice are present in these areas. • allergic to ragweed. May cause breathing difficulty or an asthmatic attack. • use a fine-tooth or special lice/nit comb. Remove any remaining nits by hand (using a throw-away glove). • for head lice, part hair into sections. Do one section at a time starting on top of head. Longer hair may take 1 to 2 hours. • lift a 1- to 2-inch wide strand of hair. Place comb as close to scalp as possible and comb with a firm, even motion away from scalp. • clean comb often. Wipe nits away with tissue and discard in a plastic bag. Seal bag and discard to prevent lice from coming back. • after combing, thoroughly recheck for lice/nits. Repeat combing if necessary. Complete lice control for your family and home. See Usage Guidelines to estimate how much product you will need. • Use towels to protect child's eyes from treatment and prevent clothes from getting wet. • Apply Lice Killing Shampoo thoroughly to DRY HAIR or other affected area. • Wetting the hair dilutes the treatment making it less effective. • Also, lice can hold their breath when immersed in water making it difficult for the active ingredient to penetrate the lice. • For head lice, thoroughly massage shampoo into scalp, behind the ears and to the back of the neck. Lice can crawl up and down the shaft of the hair very quickly so it is important to apply the treatment from the roots to the ends of the hair. • Allow product to remain on the hair (or other affected area) for 10 minutes, but no longer. • Add warm water and massage to form a lather. • For head lice, towel dry hair and comb out tangles. • Proceed to Step 2. • A second treatment must be done in 7 to 10 days to kill any newly-hatched lice. Combing must be done AFTER use of Lice Killing Shampoo (Step 1). Combing out eggs & nits* is an essential step to complete lice control. • A fine-toothed comb or the special lice/nit removing comb (included) must be used to remove lice, eggs, and nits from hair. • Find a distraction for your child (e.g. books, TV, game). • Apply detangler/conditioner and comb out damp hair with a regular wide-tooth comb to take out snarls and tangles. • Hold the Lice/Nit comb with the teeth facing you. • Working one section at a time, lift a 1- to 2- inch wide strand of hair. • Place comb as a close to the scalp as possible and comb with a firm, even motion away from scalp, from the roots to the end of the hair (newly-laid eggs are found near the roots of the hair so it is important to get the teeth very close to the scalp). Make sure the teeth are deeply embedded into the strands as you comb through. • Always comb away from the head. • Wipe eggs and nits from the teeth of the comb with a tissue or paper towel. • Pin back the 1- to 2-inch wide strand you just finished combing with a bobby pin or hair clip. • Lift up another 1- to 2-inch wide strand and repeat the combing procedure. • When one section has been combed and pinned, repeat the process for another section of hair. 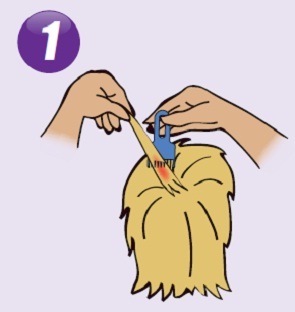 Continue to comb hair 1- to 2-inches at a time until entire head has been combed and pinned. • Keep the hair damp during combing and re-apply detangler/conditioner as needed. • After you have combed and pinned the entire head, remove all bobby pins or hair clips and rinse hair thoroughly with warm water. If desired, you may also wash with regular shampoo. • Discard all the used tissues or paper towels into a bag, seal and dispose to prevent lice from coming back. * Nits are empty eggshells left behind when lice hatch from eggs. • Use Home Lice, Bedbug & Dust Mite Spray to kill lice and their eggs on mattresses, furniture, car interiors and other non-washable items. A regular disinfectant spray will not kill lice and their eggs. • After spraying the infested area, vacuum rugs and carpets. Dispose of the vacuum cleaner bags after use. • Wash all clothes, towels, washable hats, scarves, coats and bed linens in hot water. Dry in high heat for at least 20 minutes. • Personal combs and brushes may be disinfected by soaking in hot water [above 54°C (130°F)] for at least 10 minutes. • Place stuffed toys in plastic bags and seal them for 4 weeks. • Carefully inspect infested family member daily for at least 2 weeks. If you see eggs or nits, repeat Step 2. • Check other family members for Head Lice. If anyone in the family is infested, follow Step 1 and Step 2. Repeat Step 3 with any articles or items with which they have come into contact. There may be some eggs that were not combed out after the first treatment. These eggs will hatch and need to be killed with the second treatment. • Lay small white eggs (nits) on hair shaft close to scalp. • Nits are most easily found on back of neck or behind ears. • Disinfect hats, hair ribbons, scarves, coats, towels, and bed linens by machine washing in hot water [above 54°C (130°F)], then using hottest dryer cycle for at least 20 minutes. • Items that cannot be washed (bedspreads, blankets, pillows, stuffed toys, etc.) should be dry-cleaned or sealed in a plastic bag for 4 weeks, then removed outdoors and shaken out very hard before using again. • Items that cannot be washed, dry-cleaned, or stored may be sprayed with a product designed for this purpose, such as a Home Lice, Bedbug & Dust Mite Spray. • Soak all combs and brushes in hot water [above 54°C (130°F)] for at least 10 minutes. • Vacuum all carpets, mattresses, upholstered furniture, and car seats that may have been used by affected people. • May be transmitted by sexual contact. Sexual partners should be treated simultaneously to avoid reinfestation. • Lice are very small and look like brown or grey dots on skin. • Usually cause intense itching and lay small white eggs (nits) on the hair shaft generally close to the skin surface. • May be present on the short hairs of groin, thighs, trunk, and underarms, and occasionally on the beard and mustache. • Disinfect underwear by machine washing in hot water [above 54°C (130°F)], then using hottest dryer cycle for at least 20 minutes. • Body Lice and their eggs (nits) are generally found in the seams of clothing particularly in waistline and armpit area. • Body Lice feed on skin then return to clothing to lay their eggs. • Disinfect clothing by machine washing in hot water [above 54°C (130°F)], then using hottest dryer cycle for at least 20 minutes. • Do not seal clothing in a plastic bag because nits can remain dormant for up to 30 days. Keep out of reach of children. If swallowed, get medical help or contact a Poison Control Center right away (1-800-222-1222). • apply thoroughly to DRY HAIR or other affected area. For head lice, first apply behind ears and to back of neck. • store at 20-25°C (68-77°F). Avoid excessive heat.